1 / lap times are now (good) slower than in the first two grand-prix in order to approach the lap of reality. This means that it works in the opposite direction of the boost ( + you go faster with 1 than 10, but you will eat +). > Behavior WET tires completely redone . > Fixed the behavior of the tires and Medium Hard: less volatile than before. - Slicks : between 0% and 10% rain. - Inters : between 0% and 40% rain. - Wets : between 30% and 100% of rain. > There are more KERS , it is replaced by the ERS , which is managed directly by the car. It is therefore more button to press , except to activate the DRS . > The DRS is less powerful . > Overall, the cars have a little more grip , and it is possible to lower aillerons while remaining competitive . > + Turbulence / vibration when you follow a car. > Wear and engine warming is revised upwards . Attention to the radiator. > We have now closed the park applied during Q3. This means that the setup is blocked when you try lap in Q3. > However, some settings are changed : Fuel, front wing , brake force distribution , brake pressure , " Save fuel" . Note that ( among others ) the radiator scoops are keyed and it is not possible to change . > Note: the parc fermé does NOT apply during the sessions of Q1 and Q2. Only when Q3. - Added a safety car . - Added mechanics during stops. - Best setup by default. - Fixed bugs skin ( checkered ) when the graphics are of course low / medium . - Improved French translation and adding an English translation. - And many more ... ! There are currently no setups for Mod VFR F1 2014. Add a Setup. 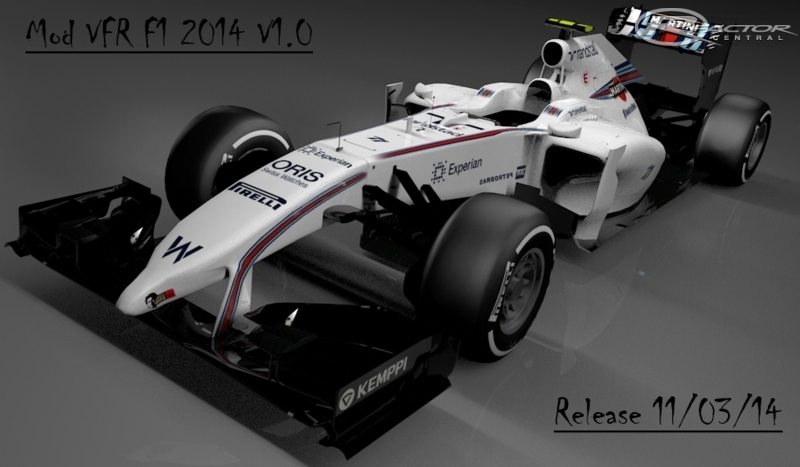 There are currently no car skins available for Mod VFR F1 2014. If you are a painter you can share skins for this mod via the Car Skins area. Visit the Spray Booth for painting tips & tricks. i have downloaded the mod , installed it and when i am going to race , it shows me some errors when the track is loading and then i cant see any car. Now only if ISI make the physics in the karts to drive like real karts....lol. Hi Guys, Im not sure if this has been mentioned before but first of all i wanted to thank you guys for an awesome mod. Top Quality. I had a proble last night when running the mod. 2 people in the race had pitted with 2 laps to go just for tyres. Fuel usage was off. When they pitted the count down timer showed over a billion seconds to wait eg. "-2194861394293 sec" 2 people were affected by this and unfortunately DNF'd. Is this a glitch in the Mod or Track ?? I suspect its the mod? They were in the Redbull and McLaren. Ive seen it before in practice but not in a race. Please help. Hey guys anyone else having problems while in an offline race when the cars pit, they have a pit time of of over -2 million seconds? It's strange, i've heard of cars getting stuck in pits before but not like this.. I love the mod! Thank you very much! One small problem I have however; some sounds seem to be missing, like skidding of the tyres and those kind of sounds. I know the sounds are there in the files, but somehow they'ew not used ingame? Maybe I have to copy certain sound files to different folder?